District eCourts is invites an application for Various Post in various Category . We are request you if you are Interested and eligible then you may apply for this Online Or Offline have to check . You can find all the details about Educational qualification and other are describe bellow. Age Limit : 18 – 40 years. Educational Qualification : You have to complete your Class 8th/10th Exam. How To Apply : you are requested Their Official website : https://districts.ecourts.gov.in Why Are you Waiting…. West Bengal Public Service Commission invites an application for Various Post in various Category . We are request you if you are Interested and eligible then you may apply for this Online Or Offline have to check . You can find all the details about Educational qualification and other are describe bellow. Educational Qualification : You have to complete your Class 10th Exam . How To Apply : you are requested Their Official website www.pscwbapplication.in Why Are you Waiting…. Railway Recruitment Board (RRB) invites an application for Various Post in various Category . We are request you if you are Interested and eligible then you may apply for this Online Or Offline have to check . You can find all the details about Educational qualification and other are describe bellow. Name Of Post : Group-D and Group-C Posts. Educational Qualification : You have to complete your 10th / 12th Exam..
How To Apply : you are requested Their Official Website: http://www.rrcb.gov.in/rrbs.html Why Are you Waiting…. 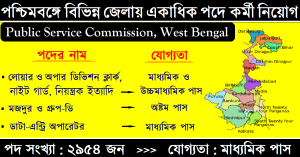 West Bengal Public Service Commission has been invites an application for Various Post in various Category . We are request you if you are Interested and eligible then you may apply for this Online Or Offline have to check . You can find all the details about Educational qualification and other are describe bellow. Age Limit : Maximum 40 years as on 01/01/2018. Educational Qualification : You have to complete your Class 10th / 12th Class Exam . How To Apply : you are requested Their Official Website : www.pscwbapplication.in Why Are you Waiting….